Details and Specification of S32 Mini-Moto Dynamometer. 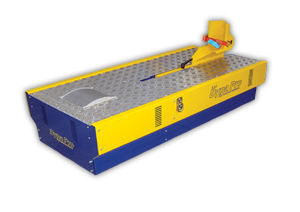 Dyna Pro Dynamometers also manufacture a range of dedicated specialist Dyno’s tailored to our customers needs. 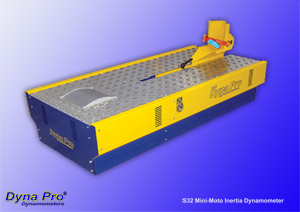 The S32 Inertia Dynamometer has been designed for Mini-Moto's, Mini-Cross bikes etc, and is capable of handling up to 50hp. These machines have all the functionality of their bigger brothers the S68, S125 and T62 Dynamometers, allowing the user to not only measure Torque, Power etc, but with the addition of numerous interfaces and sensors available can also monitor up to a further 16 channels of data including climatic conditions, exhaust gas analysis (Air/Fuel Ratio, Lambda), temperatures, pressures, throttle position etc. All of this data can be displayed ‘Real-Time’ or plotted onto graphs for further analysis. All of our inertia only chassis dynamometers come as standard with a Hand Controller Pendant, Intelligent Ignition Pick-up System, Air Brakes for emergency braking on power failure, and 12 additional analogue input channels for custom sensors. Machine Construction from 3 & 5mm Precision Laser Cut steel, powder coated finish, Blue & Yellow. Cooling Fans (High Speed, High Pressure). Wideband Air Fuel System. (Single Channel, Double Channel and Quad channel). Weather Station (Temperature, Humidity, Pressure & Relative Air Density).